The Climate Reality Project has just completed a highly successful Climate Educators’ Skillshare. 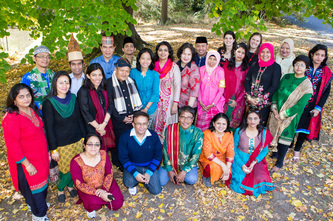 Over two weeks, 23 primary and secondary school teachers from India and Indonesia travelled throughout Melbourne and its surrounds to build leadership skills to communicate climate change science and solutions to their students and communities back at home. They visited several schools and other education centered organisations and compared notes about their experiences and the challenges they face to include climate change education in their local curriculum. All participants contributed knowledge and resources from their own cultures, working together to create teaching resources which can be used across the Asia-Pacific region. The Climate Educators’ Skillshare was managed by The Climate Reality Project Australia and supported by the Australian Government’s Australia Awards. The Australia Awards Fellowships aim to develop leadership, address regional development priorities and strengthen links between Australian organisations and partner organisations in developing countries and is an AusAid initiative. Susan Thomas - Climate Educator, India. In these countries it must be a great challenge, but in other ways there are great examples where they are showing us ways to be more sustainable in our approach, so I am really excited to be here, learning more about things I could implement they have got to teach us about too. Andy Best - Climate Leader and Principal, Australia. Yes this is the first time and I have to say to you that maybe in Indonesia we don’t have this opportunity very much. This experience will bring brilliant ideas for them to spread into their community. I think that is a good point of this program for them. Azizah Nasution - Climate Leader and Head of Green Teachers Indonesia. I reckon this could blossom in a 1000 different ways, TCRP work is already making a big difference in their community and I know these educators will too. Don Henry - CEO, Australian Conservation Foundation. SBS interview with Indian participant Sonia Kapoor. SBS interview with Skillshare participant, Climate Leader and Head of Green Teachers' Indonesia Azizah Nasution (Part 1). SBS interview with Skillshare participant, Climate Leader and Head of Green Teachers' Indonesia Azizah Nasution (Part 2). Click below for more photos from the Skillshare. Interested to hear more about the program as it unfolds? The Climate Reality Australia team is delighted to introduce two new climate change education units for teachers and students across the Asia-Pacific region. Now that she has returned home, Azizah Nasution wants to encourage more student-centred learning throughout her networks. Azizah and her fellow teachers have started by running their very own Skillshare.